There will be a lot of large-scale IT events organized in Danang such as: "DevDay programming festival;" "Web DotFes Technology Development event;" "InternationalConference on Information Technology SoICT;” and "National Conference on Information Security – Safety." At the conference "Summing up 2017 - Deploying the 2018 mission of Information and Communication major in Danang" on January 25, 2018, Assoc. Prof. Nguyen Thanh Binh - Dean of IT Faculty of University of Science and Technology, the University of Danang (DUT-UD) shared that IT Faculty and DUT-UDwill host large-scale IT events this year such as: DevDay 2018 in collaboration with Axon Active (will beheld on April 14, 2018 with over 1,500 participants, approximately 30 speakers), in collaboration with Japanese companies (Cshool, DeNA, IFV Asia) and Kyoto Seika University to hold the "2018 DotFes Web Technology Development Event" (will be held on March 18, 2018). This will be the first time for leading Japanese experts to share their experience in the establishment and development of web. In addition, in cooperation with Hanoi University of Science and Technology, DUT-UD will organizethe international IT Conference “SoICT 2018” and National Conference on Information Security and Safety" (expected in December2018). In particular, DUT-UD will organize the annual conference on "the cooperation relationship between University and Enterprises in IT." Moreover, Faculty of Information Technology and DUT-UD will organize the annual conference "School and IT Enterprise 2018". "This year, we will continue to carry out several cooperative activities with enterprises in training such as organizing seminars on new techniques and technology for students and inviting experts from enterprises to teach professional courses andvocational orientation for students, "- said Assoc. Prof. Dr. Nguyen Thanh Binh. 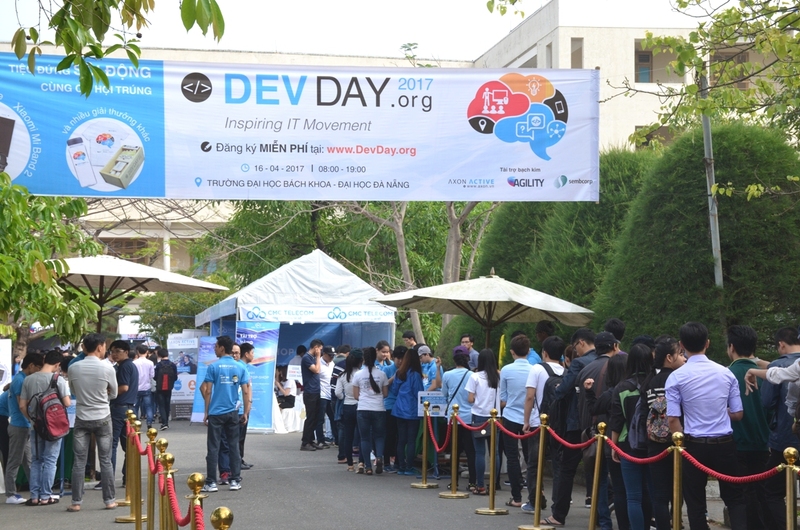 "DevDay 2017 Programming Festival" is recognized as one of the festivals of the IT community in the whole country, attracting a lot of students, IT programmers and officers to attend." It is known that in April 2018, DUT-UD will welcome and work with the accreditation team from AUN (ASEAN University Network, a network of leading universities in Southeast Asia). During this visit, AUN representatives will carry out the international accreditation missionin QA (Quality Assurance) for IT training program. Therefore, Faculty of Information Technology of DUT-UD will become the first faculty specializing intraining IT to be assessed according to the standard of AUN. In over 30 different disciplines, IT has been identified as one of the key training majors of DUT-UD. Over 25 years of IT training, DUT-UD has trained more than 5,000 engineers; more than 1,100 masters and 14 Ph.D. Currently, DUT-UD has about 1,400 BA in engineering; 100 MA students and 30 doctoral students. In 2018, DUT-UD expects to recruit 200 students for the traditional training program; 45 students for the high-quality training program according to Japanese standard; 30 students specialized in Software Engineering for the Vietnam-France high-quality training program (PFIEV), a training program in cooperation with Polytech Marseille University (France); and 90 students for the high-quality training program in collaboration with enterprises. As of 2018, Faculty of IT, DUT-UD has four different training programs, including three high-quality training programs. Assoc. Prof. Nguyen Thanh Binh also shared that in Hanoi, senior leaders of the two ministries (Education - Training and Information - Communication), chaired the meeting with participation from UD and Vietnam-Korea Friendship IT College. This was a very important meeting to discuss and implement the Prime Minister's conclusion (in Announcement No. 542 / TBVPCP dated on November 22, 2017). Accordingly, the Vietnam-Korea Friendship Information Technology and Communication University will be expected to be established based on therearrangement of the IT training units of UD and Vietnam-Korea Friendship IT College.